Requiring a new 2 metre band antenna for local FM simplex and repeater communication and after evaluated a couple of the main contenders for the project I settled on the 5λ/8 wave ground plane to be designed for approximately 146.5MHz. The reason for selecting the 5λ/8 wave ground plane is that for a simple single element antenna it appeared to have increased capture aperture when compared to the standard λ/4 wave length ground plane antenna and has a relatively low angles of radiation in comparison with other similar antennas. The increased capture aperture or gain for single radiating element increases as the radiating element length is increased until the length of the radiator exceeds the magical 5λ8 wave length at which point the increasing radiator length causes the radiation pattern to begin breaking up into a number lobes and nulls. The optimum length is in fact equal to or slightly less than 0.6λ. 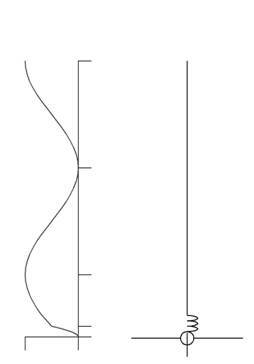 The standard quarter-wave radiator loads up against a ground plan with a typical impedance of 36Ω which will match the standard 50Ω coax feed line with a SWR (standing wave ration) of about 1.5 to 1. Figure 1 show the impedance distribution along the radiating element of a typical λ/4 ground plan antenna with the ideal low impedance at the feed point. When the radiating element is extended out to a half-wave length we are now looking at a high impedance node at the feed point as shown in figure 2 that is impossible to match with the 50Ω coax feed line without some sort of matching circuit. If however the radiator element is increased to a 3/4 wave length the feed line will see an impedance value at the feed point that is similar to that of the quarter-wave radiator as shown in figure 3, however while this overcomes the matching issue the 3/4 wave length introduces a poorer radiation pattern. The trick is to make the 5λ/8 radiator appear to the feed line as if it were a 3/4 wave length; establishing a good impedance match while at the same time achieving the ideal low angle of radiation that can be realised through the 5/8 wave radiator. 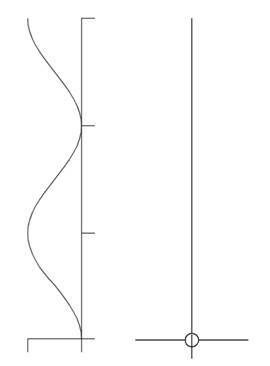 By add a series loading coil at the base of the radiator to compensating for the lost λ/8 section a match of close to 50Ω can be obtained as shown in figure 4. It is also much easy to design a matching circuit for a 5λ/8 radiator than the more extreme impedance presented by the 1λ/2 radiator. Having reviewed a number of designs I decided that the simplest approach was to cut a sample radiator to the physical 5λ8 for 146.5MHz reducing the overall length by about 5% to allow for the material physical diameter and then forming a loading coil from a λ/8 equivalent length of enamelled coated copper wire. The size of the loading coil is then adjusted until a sufficiently good match is achieved. 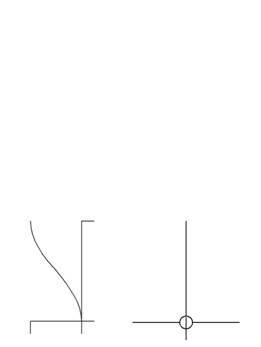 The design consists of a re-hashed commercial whip antenna that was design for an unknown frequency, possibly low band VHF. The original antenna consisted of a stainless steel whip mounted on an insulated tube containing some sort of loading coil. After cutting thought the bottom end of the tube too asses the construction the existing loading coil was removed. At this point it was decided to wind the new loading coil over the outside of the insulated tube and soldered the coil tails to the tube end caps, allowing for easy removal and experimental adjustment of the coil. The length of the loading coil wire was determined by the physical length of λ/8 at 146.5MHz less 5% to allow for the effect of the wire diameter and less the length of any metal antenna hardware between the bottom end of the coil and the attachment with feed line. The additional tail from the top of the coil would ultimately be deducted of the final length of the 5λ/8 radiator as it would be part of the radiator. Photo 1 Installed re-designed matching coil using recovered insulated tube. There are two loading coil configuration for the 5λ/8 radiator. The first being popular with commercial mobile manufactures and which is also the approach that I have taken, which is to simply add the loading coil in series with base of the radiator. See fig 5. 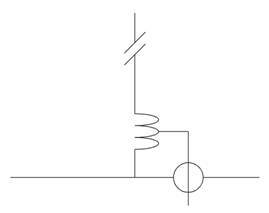 The second slightly more complicated method to set up is to ground the base of radiating element to the ground plan via the coil and tap the feed line into a the coil as in fig 6. 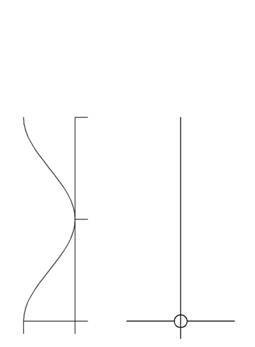 The second method is in many way superior in that it allows the antenna to be turned to resonance eliminating any reactive component while achieving a perfect match to the 50Ω coax feed line. The first method is a bit of a compromise in that to achieve a good match to the feed line; however the antenna may be some what reactive. The second method has the benefit that when the antenna is mound high on a mast that the entire antenna is at DC ground and will give some lightning protection to attached equipment. While the second method requires a lot more trial and error, it represents the superior approach and is intended to be employed on future prototype antennas of this type. Despite the antenna and mounting hardware being of a reworked mobile vertical antenna, the intention is that it be used as mast mounted antenna and therefore feed it with something better than RG58. A solution was to redesign a standards mobile antenna mount with a Female 'N' type coax cable connector that would be robust and more importantly weather proof. Below is an explanation of how the standard mobile antenna mount was modified to for the feed attachment for the ground plane antenna. It is important to remember that mobile antenna mount of this type vary considerably in the design and any attempt to duplicate the this process should use this description as a guide only. Figure 7 Explanation of how the standard mobile antenna mount was modified for the feed attachment for the ground plane antenna. B - Weather proof cone. C - Aerial mounting stud and insert guide. E - Ground plane mounting base. 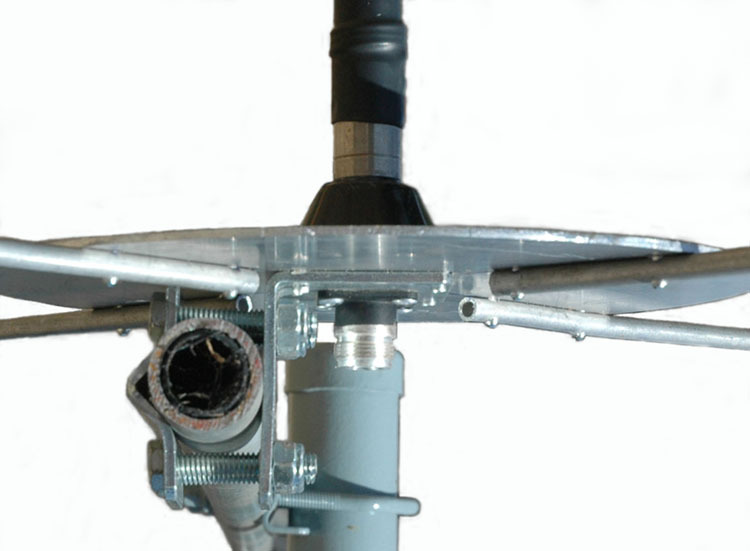 The standard mobile antenna mount is disassembled with the coax screen ground insert being discarded and the insert guide skirt of the aerial mounting stud assembly trimmed so that it remains flush with the bottom of the weather proof cone when assembled. The female N connector is pop-riveted to the ground plan base disc and the aerial mounting stud is connected with a very short and flexible lead to the female N connector centre pin. 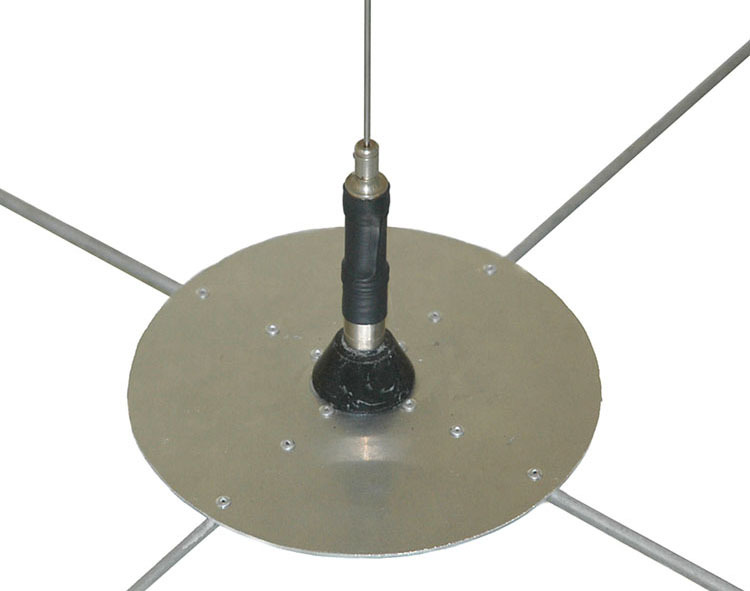 The weather proof cone is then seated over the aerial mounting stud and fixed in place with two self tapper screw to the ground plan base disc from beneath. A light bead of marine grade silicon is applied to the bottom of the weather proof cone before it is attached. The retaining nut is then installed with care not to over tighten. See below complete assembly. With the antenna assembled on an easily accessible test mast well clear of the ground and surrounding metallic objects, the antenna was connected to an AIM 4170C antenna analyser to ascertain how the antenna loaded up. The goal here is to find the operating frequency of 146.5MHz compromise between being close to the resonant frequency and achieving best possible impedance match resulting in an SWR of about 1.5 - 1 or less. The initial plot indicated that the antenna was resonant around 135MHz, while the 5/8 radiator can be trimmed at the final tweaking stage the most important feature of this antenna is to maintain a radiator length of slightly less than the 5/8 wave length, therefore the first component of the antenna to be adjusted is the loading coil. One complete turn was removed at the first attempt resulting in the analyser indicating a good SWR and resonant frequency of around 152MHz. Third time lucky, after winding a new loading coil with a third of a turn more than the previous coil the result showed a resonant frequency of around 146MHz after a bit of fine adjustment by compressing the coil a little. Finally with only the most modest trimming of the radiating element the required parameters were realised with a resonant frequency of 146.5MHz and a SWR of 1.32 at 146.66 MHz. It is important that the heat shrink tubing that will be used to weather proof the loading coil assembly is slipped over the coil to reveal the effect that it will have when it is finally shrunk into place as the effect of the heat shrink tubing lowers the resulting ideal frequency by as much as 1MHz. Once shrunk the ideal frequency is lowers slightly further. Requiring a bit of guess work a very close result is not at all difficult and a bit of trimming of the main element will allow target specification to be achieved. I have been surprised at how little detail information actually exists on both the internet and resource book regarding the principles and performance of 5/8 wave ground plane and similar antennas. There is much discussion related to theoretical gains in comparison with similar antenna types, but little about the hash reality of real world antenna performance. With some on air comparisons and antenna modelling there appears to be no dramatic performance advantage between for example a simple λ/4 ground plane and that of the 5/8 wave ground plane. It appears that while the 5/8 wave ground plane exhibits some improvement in performance in comparison with the simpler λ/4 ground plane the big performance improvements for 144MHz and high is as everyone knows antenna height and high quality low loss coax. This project has challenged a number of personal antenna myths, created the necessity of a bit of experimental tinkering along with detailed measurements and test to produce a new station antenna that has met the original design goals. 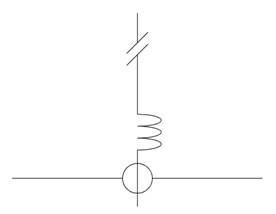 Article on Degrees of Antenna Occupied by a Loading Coil. The purpose of this article is to provide a procedure for determining the number of degrees of antenna occupied by a loading coil. A later article will explain how that value applies to inductively loaded mobile antennas.